Being located out in the Taklamakan Desert below sea level it is hard to imagine anything growing in the barren, rocky landscape however Turfan is known for its grapes, melons and the nearby flaming mountains, as well as having the notoriety of being the hottest place in China. Built some 2,000 years ago the ancient Karez irrigation system not only brings miraculous life to the dusty plains making Turfan a productive fertile pocket of land but it also cemented the town as a key stopping point on the Silk Road for caravans and traders in years gone by. The totally awesome ruins of Jiaohe are a fantastic place to wander and conjure up visions of what times past might have been like in its heyday. Home to the stunning Emin Minaret, a building that well and truly caught my eye for its simple yet intricate beauty, this is one of the first stops when travelling west that you will really get a taste of Uyghur culture. But the morning I spent exploring the local animal market was an unexpected highlight of my time in this desert oasis. Wandering among the action was a great introduction to local life and about as far away from the tourist trail as you get. We did get lots of enquiring looks of bewilderment, with many not quite actually able to work out what could possibly be interesting about watching herders and towns-people buying and selling sheep, goats and cows. Everyone was incredibly friendly and curious, though a little camera shy at the beginning. The Uygur food is absolutely delicious, particularly if you are a meat lover and the atmosphere in the old parts of town is magic as donkeys “clip clop” their way along the streets. Turfan has lots to offer and is an excellent place to spend a few days getting caught up in the fabulous legends of the Silk Road. Jiuzhaigou is spectacular Chinese alpine scenery, a world heritage site and world biosphere protected area in mountainous northern Sichuan province, China. The picturesque mountainous landscape is peppered with brilliantly coloured lakes and waterfallls ensconced among dense, verdant forests. I was totally blown away by this place when I first visited in 1997. It was early October and the magnificence of fall was in full swing. The trees were all shades of crimson, orange and yellow contrasting beautifully against the jewel coloured lakes. The images you see here were taken when I returned at the end of May 2002 and were shot using the gorgeous Fuji Velvia slide film. The impossibly green forests and brilliantly coloured, sparkling water that you see in the images is in my mind exactly how it looked – simply stunning!!! The old city of Pingyao is simply enchanting – well it certainly was when I visited there during 2001 and 2002! Bursting with charm this age-old enclave’s intact ancient city wall is quite possibly the best in China and offers fantastic views across the old town. This is great for the contrast between the well-touristed and not-often-visited areas of town. I have a few memories from Pingyao; one was being on the wall and watching as a farmer walked a small herd of sheep into the back streets of the old town, a fantastic photographic moment. The other was the horse and donkey carts clip-clopping along the rustic streets. 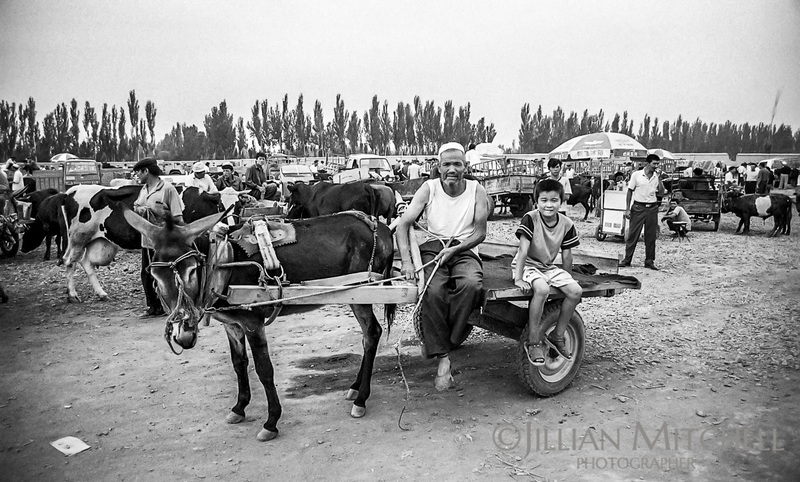 I was easily engulfed with horse cart-mania every time I heard one coming, and often the old guys driving or leading them were just as photogenic. The traditional architecture is fantastic and as with most Chinese towns the best time to be out and about with a camera was from 6am onwards, as this is the best time to catch a real glimpse of local life and miss the tourists. These images were all taken on black and white film. After going digital more than 10 years ago working with film gives a total different look and feel to images, one that I think works incredibly well with this subject matter. 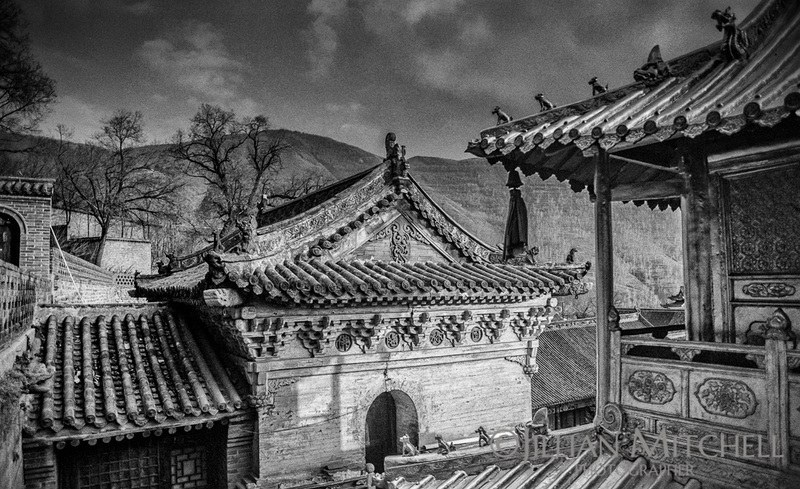 To see more images from Pingyao click here. As one of China’s 4 sacred Buddhist peaks, Wutaishan is actually a collection of five peaks or plateaus that is home to in excess of 50 temples and monasteries. Declared a UNESCO World Heritage Site in 2009, Wutaishan is a great place to explore for a couple of days. One of the things that stood out for me here was the level of decorative elements in the brass-work and exterior paintings/murals. Both symbolic and intricate, they really set some of the temples here apart from the many, many others I have visited in China. Sunrise from the east peak is a must! To see more images from Wutaishan click here.